General Jeffery, David Fricker, Kerry Jones, members of the CEFA board, Senator the Honourable John Faulkner, Mr Freeland, who’s firm Baker & McKenzie have kindly been sponsors of this event, Mr Howe thank you for your very gracious welcome to country, other distinguished guests, ladies and gentlemen. It is a pleasure to be here with you this evening, but I’m afraid you must be a little disappointed to see me because of course you were expecting to see the Prime Minister who conveys his regrets and apologies as I’m sure you all know the Prime Minister has been in Northern New South Wales this afternoon for the very sad occasion of the funeral of Mr Phillip Hughes and has asked me to represent him this evening and to deliver the remarks that he wished to deliver on this important anniversary. Can I begin by acknowledging the traditional custodians of the land on which we meet and pay my respects to their elders past and present. It is fitting we hold this event in one of the great buildings of our democracy – the custodian, the showplace of so many of the great instruments of our democracy and I was privileged to be shown a few of them just before. You can almost smell the history in this building – you can certainly see it with your own eyes. We understand when we see the treasures which this building holds what Edmund Burke meant when he said: “Society is indeed a contract. It is a partnership . . . not only between those who are living, but between those who are living, those who are dead, and those who are to be born.” In this building if you watch, and if you listen closely, you can read and you can hear the echoes of debates past – and as you listen, you know it is part of your own history – part of what it means to be Australian. One of those great echoes is the speech Neville Bonner gave in defence of our Constitution during the Constitutional Convention held in 1998. We have a rich history founded on the firmest of foundations – our Constitution. Australia is one of the oldest continuous democracies in the world and we owe so much of the success of that democracy to its constitutional foundation. We can build a stronger, more prosperous Australia because the foundations have been laid and set by the instruments, by the documents which are the treasures which this building preserves. 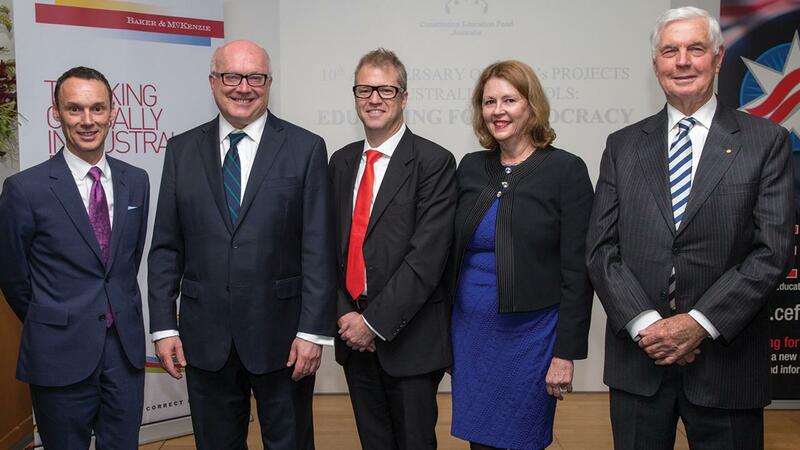 I congratulate CEFA on the 10th anniversary of its ‘Educating for Democracy’ projects in Australian schools. By promoting understanding of the Constitution, you are strengthening it – because the more people understand our Constitution and its importance, the more will rally to its defence. For ten years, the ‘Educating for Democracy’ projects in Australian schools, run by CEFA, have empowered students to become knowledgeable, responsible and active citizens. In the course of teaching Australian school children about our constitution you, I know, remind them that it is largely because of that constitution that Australia was born of evolution, not revolution. Not a single drop of blood was shed in its drafting. We can trace our Constitution back some 800 years to the fundamental principles enshrined in the Magna Carta: limiting arbitrary power, holding the Executive to account, and affirming the rule of law. I look forward to celebrating the 800th anniversary of the Magna Carta next year, together with CEFA. The principles enshrined in Magna Carta have in common principles enshrined in our own constitution. They are principles that underpin our sense of a fair go and our democratic values. The Constitution has helped move us from colonies to an independent nation. And it is a Constitution governed by the people because only the people can change it. That is why it has been changed so few times. Changing the Constitution was meant to be hard: it requires an act of Parliament, a vote from the people and a majority of four of six states. It is rightly much harder than changing a law but it is not meant to be impossible because our Constitution’s founders never imagined that this core document should never change. In coming years, there will be a debate on how we can complete our Constitution – by recognising Aboriginal and Torres Strait Island people in our founding document. Modern Australia has an Indigenous heritage, a British foundation and a multicultural character. Indigenous Australians have lived up to the ideals of the Constitution: they have fought for ‘King and country’ in both World Wars; they have served in our Parliaments; and they sit as judges in our courts. Indigenous culture, after all, is part of our common heritage as Australians; as much as our language, our Parliament, our system of law and our crown. The Prime Minister, like the former Prime Minister, John Howard, and the members of Mr Abbott’s Government have come to the realisation that we must support the recognition of Aboriginal and Torres Strait Islander people in our constitution. The Constitution is founded on our British political and legal traditions. Just as the Constitution recognises our British heritage, it is right that the Constitution also recognise the first peoples of Australia, and their special, but not separate, place in our national life. My hope is that any future referendum to recognise Aboriginal and Torres Strait Islander peoples will echo the success of 1967 referendum. In 1967 we saw a small change to our constitution, but a big change to our country. A referendum on Indigenous recognition won’t so much change the Constitution as complete it. The bipartisan committee, chaired by the House of Representatives’ first Indigenous MP, Ken Wyatt, will soon be making final recommendations about the precise words that the committee thinks should be included in the constitution. We should be prepared to consider and refine any proposal for some time because it is so much better to get this right than to rush it. A successful referendum would be another demonstration that Australia can be, in every way, a beacon of hope and an exemplar of unity and decency. Recognising Aboriginal and Torres Strait Islanders in our Constitution will be a unifying moment for our nation – just as the 1967 referendum was a unifying moment for our nation. It will draw together the two strands of our history, rectify an oversight and ensure that the Constitution continues to be of the people and for the people – for all the people of Australia. CEFA have been over these past ten years champions of the Constitution. I ask all of you here today to become champions of Indigenous constitutional recognition as well, so we can ensure that the document we cherish best reflects our modern Australian society.